This was a really good choice after my HP problem. 🙂 It seems to me that Mercy Thompson series is getting better with each new installment which is not something I can say for many others. Quite the contrary, several series I enjoyed reading, I read no longer as I lost interest. Or even when I do, they are just not as good as I remember the previous books. Not so with Frost Burned. Although I admit to forgetting some previous plots in the meantime (or the fact that Samuel had a fae mate?! when did that happen?). So, while writing this review I went to check the previous books and I realized I have missed River Marked. I just don’t think I would have so completely forgotten so many referenced things in this novel if I had read all of the previous ones. That is why River Marked is on my list just after I finish Inferno by Dan Brown. 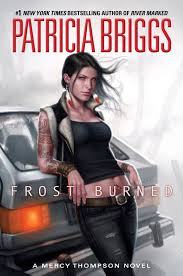 Frost Burned starts off action packed and rather thrilling. I know I oftentimes mention my frustration with characters being stubborn to the point of stupidity, and even though Mercy would fit as a stubborn person with her idiosyncrasies, she is never stupid, quite the contrary. So, it can be done in YA novels too (because I don’t find teenagers stupid – albeit Mercy isn’t a teenager but I would say it still applies). There are many times in the story where Mercy’s intelligence and practicality are displayed and I loved it! The more I know her, the more I like her. One part that made me smile was when werewolves are being all secretive and the message going around is that there were some “disturbances in the Force”. 😀 I am not a geeky fan of Star Wars but I love cross-references like this. One other point that I’d like to comment on is the fact that some authors have the ability to make you root for the bad guys to get killed as soon as possible (by the end of the book at the latest if it can’t happen sooner). I could mention many things I enjoyed in this book – like how it made me think how our early religious beliefs (well, they are not exactly ours when we are children) but how they can influence your adult life to a painful for the soul point. How being evil is not exclusive right of the male gender. Basically, I can’t wait to finish Inferno so I can go to River Marked (as it’s making me a bit upset at some points). Hi Ines, you will definitely enjoy River Marked, it is one of the best in the series. I especially enjoyed the use of actual places here in the Pacific Northwest. I love visualizing books in places where I have been. The Columbia river is an elemental force of nature that affects the life and history of the whole region, also it is the most beautiful river I have ever seen. I do feel P. Briggs novels are getting better the longer she writes. I can’t wait now to read about the Columbia river! Dionne, I wasn’t going to mention anyone in particular but can’t help agreeing with you Unfortunately, Kim Harrison’s Hollows series seems to be going in that direction too, albeit I will read the one that came out in January, it’s not that bad yet.